A Fast Growing Perennial Vine native to southeastern United States Blooms From Late April Through September, Dying Back In Winter And Returning In The Spring. Prefers Well Drained Soils, USDA Zones 5-9. Maypop tolerates drought well and is common in old fields and along forest margins. Dies back to ground in winter but recovers in spring. Propagation: Seeds, cuttings. 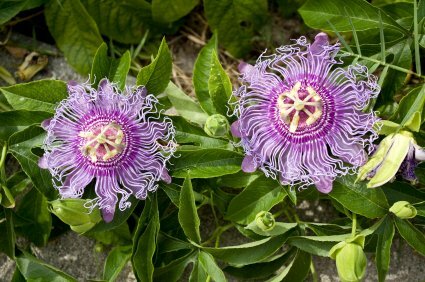 Grow maypop vines on fences or trellises or allow it to scramble over shrubs and trees. The vines grow a foot or two and use their tendrils to climb from branch to branch to about 10 or 12 feet until frost kills it back to the ground. The buds open one by one beginning at the oldest part of the vine and proceed sequentially along its length. Maypops are mostly pest free. The maypops are the size of a small hen's egg with yellow-green skin juicy, but seedy pulp. They are said to taste a lot like guavas.